Dubbed as Bethesda Game Studios' most ambitious game yet, the award-winning action role-playing game, "Fallout 4," is being re-released in a DLC-packed, Game of the Year edition in September. Additional treats also await fans who will avail of the limited Pip-Boy collector's edition. In "Fallout 4," the player takes on the role of the sole survivor of Vault 111. Its open world environment features a post-apocalyptic retro-future spanning the regions of Boston, Massachusetts and some parts of New England collectively known as "The Commonwealth." The prologue opens in 2077. The Great War is still ongoing, and the bombs have just been dropped, leading the playable character to take shelter in Vault 111. The main story then begins in 2287, 210 years after the Great War and 10 years following the events in "Fallout 3." The playable character has just woken up to a world destroyed by nuclear war. He or she will be forced to fight for survival while determining the fate of his current Wasteland. "Fallout 4: Game of the Year Edition" will include this fully updated original game along with all of the six downloadable content (DLC) packs released for the title. This will consist of the Automatron, Wasteland Workshop, Far Harbor, Contraptions Workshop, Vault-Tec Workshop, and Nuka-World. These DLCs give the players the ability to build and mod their own custom robot companions, design and set up cages to trap live creatures, construct their own complex gadgets, and also create a massive underground vault for potential new dwellers. DLCs like the Far Harbor and Nuka-World also offer side quests that will bring players some higher-level armor and weapons to add to their arsenal. 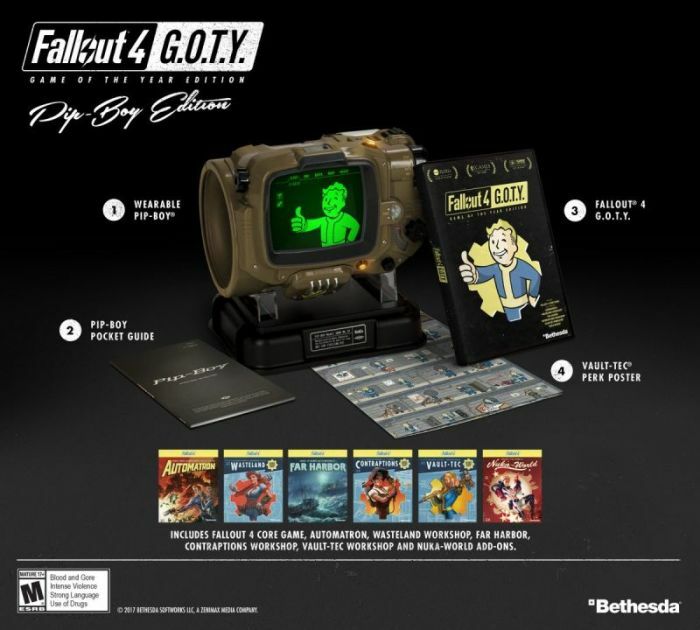 On the other hand, the Pip-Boy Edition will include all features of the Game of the Year Edition plus a Pip-Boy replica and stand, a physical Pip-Boy pocket guide, and a physical Vault-Tec perk poster. The Pip-Boy replica is a wearable device that faithfully replicates its in-game counterpart, and it is designed to accommodate a number of smartphone devices. It is the perfect accessory for the official Pip-Boy companion mobile application that gives players the ability to manage their in-game inventory along with other perks. Both the Game of the Year and Pip-Boy editions will officially be released on Tuesday, Sept. 26, and they are now available for pre-order on Bethesda's online store. "Fallout 4: Game of the Year Edition" will sell for $60, while the "Fallout 4: Game of the Year Pip-Boy Edition" sells for $100 and is only available to ship to the Continental U.S.